Exploring how topography was deployed as an instrument of French state formation in Louis Garneray’s Vues des Côtes de France. While the phrase ‘topographical images’ often calls to mind lush green landscapes, this article addresses a less familiar but very pertinent site of the topographic: ports. 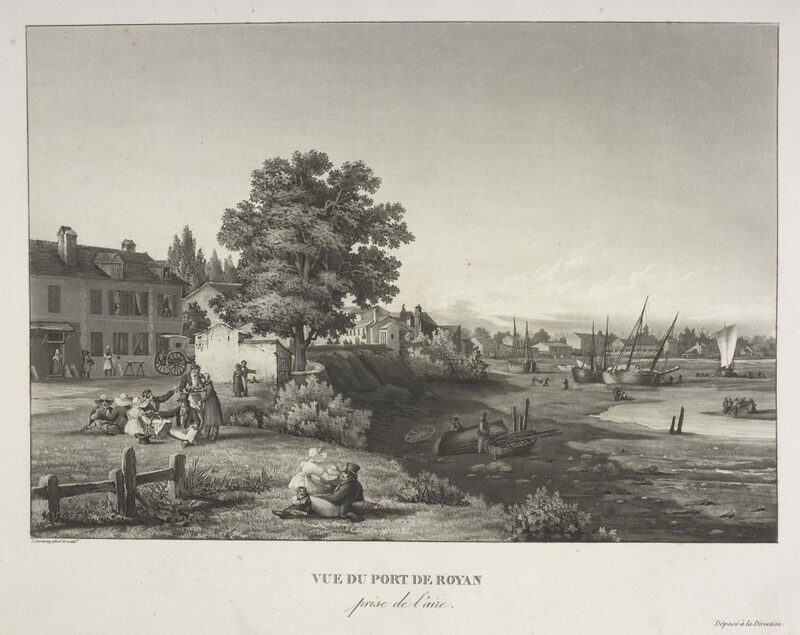 Specifically, Louis Garneray’s depiction of the ports of France in his Vues des côtes de France (1823–32) will be examined, one example of which is held in the British Library. Looking at Garneray’s ports, we are taken on a leisurely tour of France, traveling along its coasts and down its rivers, observing the breadth and diversity of its regions. The trip is, at times, too leisurely, and the images verge on the banal – but, as will be suggested, that banality is part of how they functioned. In Hendaye, for example, the first port we encounter in the Views, we see a bright, calm day, perhaps late morning. Two ships sail along flat seas, a dozen more linger at the docks. We observe all this from a vista, high above the port, where the artist has included a small self-portrait, sketching the very scene we are enjoying. A shepherd behind him gestures toward the water, gently leading our gaze outward, to the open sea. Looking down, we scan the rooftops of the town; a church steeple rises up across the bay. To the left a journeyman hands a letter to an officer. Yet all told, not much happens in this scene, nor is there any indication that the site is of particular importance or interest. We will return to Hendaye and its significance below, but for now we will focus on the unremarkable quality of this picture – the way it conveys the impression of the everyday rather than the extraordinary. Garneray’s Views are an updated version of an earlier and much more renowned project: Joseph Vernet’s Ports of France, commissioned by Louis the XV in the 1750s. Ports were one of the first sites depicted topographically in fine art in France, and Vernet’s grand paintings – nearly 5 x 8 feet – remain the best-known examples. Commissioned to depict 24 ports, Vernet finished only 15 before the project was interrupted by the catastrophic conclusion to the Seven Years War, which brought a clear end to the triumphal spirit evoked in the paintings. Each completed tableau offers a sweeping panorama of port architecture, local commerce, inhabitants, and a variety of sailing vessels rendered precisely. Vernet’s paintings, like Garneray’s, were distributed in an extremely popular series of engravings and have been referred to as the most widely reproduced set of images of the ancien régime. Vernet, and later Garneray, deployed the topographic as a way of demarcating the individuality of France’s regions while still inscribing them within the larger nation. Yet Garneray was working in a different political moment than Vernet, and his views are, without question, less grand. Vernet’s paintings were done at the bequest of the king, to glorify his sovereignty; Garneray’s were done at a far less triumphal moment for the nation. While France continued to recover from Napoleon’s defeat in 1815, in the 1820s the French fell definitively behind the British Royal Navy. Garneray’s images, in turn, show a quiet coast, uneventful towns, undisturbed vistas. It is here, in the images’ quotidian character, that a more discreet form of politics is apparent: a policing of the limits of France. Ports opened France to the world, but they also made her vulnerable – Garneray’s images, as will be argued, worked to symbolically secure the nation at this porous site. The attentiveness to detail inherent in the topographic, combined with an emphasis on the larger national context implied by a series of views, allowed for a subtle politics of place that particularly suited the 19th-century state. After the French Revolution, land needed to be recoded to accord with the new Republic, as diverse provinces were brought into a centralised, bureaucratic state system. Topographic representation was one way of achieving this. By topographic, a definition akin to John Barrell’s is intended, derived in part from Stephen Daniels’ work on Paul Sandby: the topographic as ‘at once comprehensive and acutely specific about the nature of a particular place, understood in its relation to the wider cultural, economic, political geography of the nation’. Landscape painting took on unprecedented importance in the art production of the 19th century. In 1801, Vernet’s tableaux, formerly housed privately, were placed on public view in a naval museum in the Ministry of the Marine. They replaced the tapestries of the crown that had previously adorned the space, demonstrating how landscape came to stand in for more literal emblems of power. The state further invested in the production of topographic painting in 1817, when a competition was announced to institute an Official Painter to the Navy. Garneray, the child of an artist – his father studied with Jacques Louis David – but himself untrained, won out against more advanced competitors, including Jean-Francois Hue and Louis-Philippe Crepin, both of whom had studied with Vernet. Garneray was and remains better known as a sailor; he published the more dramatic episodes from his time at sea in a series of spectacular memoirs, including Mes Pontons, in the 1850s. His selection, then, as Official Painter to the Navy indicates that artistic capability had to be combined with in-depth knowledge of the seas, ports, and sailing vessels. The Official Painter was responsible for battle scenes, in addition to the topographical imagery. Garneray began the Views in 1820. He claimed that Vernet’s series was not only incomplete but out of date, and he tasked himself with updating it. Supported by the state, he set sail across France, recording his impressions in sketchbooks and in a series of small paintings, some of which are depicted in this article. He covered a range of ports, oceanic and fluvial, large and small, Atlantic and Mediterranean. Garneray engraved the images himself – a point which will be returned to – and they were distributed in 16 installments of four views apiece between 1823 and 1832. The 64 total images could later be bound in volumes, such as the one in the British Library collection. Luxury editions were hand-coloured by the artist himself. The intended audience was wide: sailors would appreciate the ships, locals would enjoy seeing their region depicted, women and children could practice drawing by copying them. The views were accompanied by text written by Garneray’s friend and academician, Etienne Jouy, who had traveled alongside Garneray on his voyage. Jouy’s narrative reads like a travelogue, and invites us to imaginatively sail along the coast with them. He tells us, ‘It’s a Sunday, late in the day, that we debark at Royan’. Or ‘The shortest and most agreeable route for the traveller who, leaving Quilleboeuf, is searching new aspects and new pleasures, is to navigate the Seine’. Jouy remarks in his text upon industry, population count, history, and notable monuments, elaborating the vision given by Garneray. He also takes care to indicate changes brought about by the Revolution, highlighting Garneray’s modernity in relation to Vernet. Published by Panckoucke – noted even in the title page to the Views as the publisher of the Description de l’Egypte, the encyclopedic account of Egyptian culture as seen by the French – Garneray’s project was associated from the outset with pretensions of scientific accuracy. He went to great lengths to record in detail the regional specificity of each port, including inhabitants, customs, industry and trade, types of boats, style of architecture, landscape and natural features. One reviewer tellingly claimed that Garneray had ‘collected everything worthy of attention’ on his trip along the coast, a phrasing that indicates a possessiveness redolent of encyclopedic projects. The Views were even cited, approvingly, in a fashion magazine for Garneray’s representation of local costume; the reviewer claimed ‘site, naval vessels, costume, all is true in his compositions, and done in such a way as to satisfy both the sailor and the man of the world’. The veracity of Garneray’s representation is a point continually remarked upon by both supporters and critics. His images are noted as being ‘faithful portraits’ rendered on site. Beyond having seen each port with his own eyes, it was in engraving the works himself that Garneray seemed to offer the greatest guarantee of their accuracy. He thereby managed to preserve, according to one author, ‘a rare quality of exactitude and sentiment which is always lost when the original is submitted to the burin of the engraver’. Veracity, or rather the impression thereof, is frequently taken to be a sign of a lack of imagination, perspective or politic. Garneray and Jouy themselves proclaimed the views to be non-political. The preface to the volume affirms, ‘No political reflection will inflict its gravity or sadness on this project’. Jouy had been imprisoned for three months in 1823 for his liberal tendencies, so the caution was warranted. But, as we will see, representing territory is always political. In some cases the political import of Garneray’s Views is obvious: even the selection of what to include or not to include in the volume was subject to fluctuating geopolitical relations. 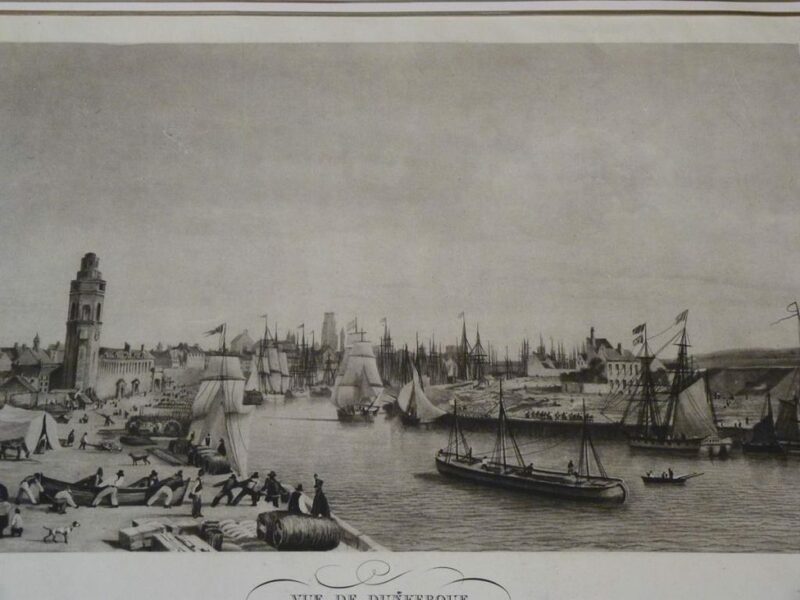 Preparations were done, for instance, for the port of Anvers (or as it is known today, Antwerp) around 1830, when it appeared it would be reclaimed by the French, but ultimately the engraving was not included in the final series; today it is classified with ‘foreign ports’ at the BNF. When the French tricolore flag was reinstated following the 1830 Revolution, it found its way into Garneray’s painting of Le Havre, allowing him to more definitively denote the site as French. He would also deploy the tricolour frequently in late-edition, hand-coloured versions of the engravings, replacing previously blank or solid coloured flags. For example, an early hand-coloured engraving of Saint-Jean de Luz has a small white flag in the center; in a later edition, Garneray has transformed that white flag into the tricolour. This final touch, the hand-colouring, complicates our study of the images, introducing another layer of meaning and further emphasising their role in demarcating the nation. Differences between Garneray’s painted studies and the published engravings can also be telling as to their political content: an American flag that fluttered high above the fort of Saint Nicolas in Marseille in Garneray’s painting, signaling the port’s internationalism, has been lowered in the engraving, which would have seen wider distribution. Toulon offers another example, as it required significant repositioning to accord with the unfavourable view of Napoleon taken by the Restoration monarchy. Napoleon had had his first decisive military triumph during the siege of Toulon, a well-known event. While Garneary’s painting borrowed Vernet’s focus on the port’s military resources, showing mounds of cannonballs in a well-stocked and active arsenal, in the two engravings showing the port, we are positioned instead at a distance. This second view even offers a small vignette with travelers resting on abandoned cannons; Garneray replaces purposeful activity with picturesque ruin. His shift away from Vernet’s more militaristic tone is also a shift away from the site’s association with Napoleon’s victory. Even within the anecdotal vignettes that animate Garneray’s Views, there are references to the state: customs officers figure in several ports, imposing an aura of control and regulation. Yet the majority of Garneray’s scenes convey an overwhelming dailiness, a lack of exceptional activity. Jouy himself is forced to admit in the text that when it comes to Royan, a small estuary port north of Bordeaux, ‘there is not a single remarkable monument’. Garneray’s Royan is a scene of leisure, focused on picnics on the grass, the only ships pictured having docked for the day in the shallow tide; not much happens, but in some ways that is the point. These slow, watchful renderings proffer the topographic as a mode of patrol. Garneray and Jouy’s detailed tour of France thus acted as a kind of border control. 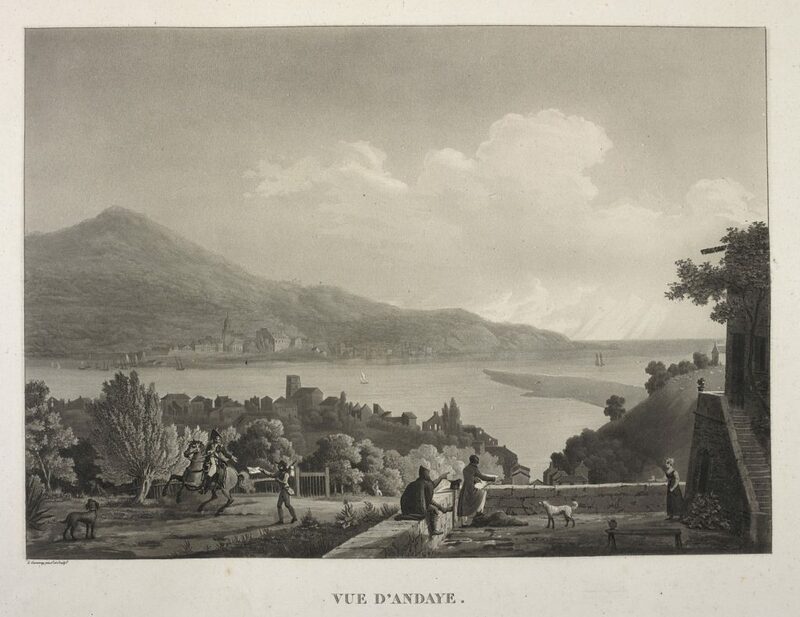 The images’ role as a form of border control is tacitly acknowledged and reinforced in the very order of their presentation: as mentioned above, the first image in the Views is of Hendaye, a small town in Southwest France. Its significance lies not in its status as a port but rather in its location on the border between France and Spain. In his description of the scene, Jouy alerts us to the fact that we, as spectators, stand ‘precisely on the extreme limit of French soil’. In constructing this image, Garneray placed himself, in order to place us, as viewers, on the border between France and Spain – and it is from this point that we enter into his oeuvre. We then move, via the text and engravings, north along the Atlantic, occasionally veering inland, before turning to the Mediterranean and circling back. The effect of a succession of 64 images that circle France in geographic order, beginning at its furthest edge, is to trace the contours of the nation, to declare what does and does not belong. The sheer quantity of representation Garneray produced contributes to the Views effect. So many ports, so carefully rendered, can overwhelm the viewer. The surplus of detail makes it paradoxically difficult to focus on any one detail, and instead we leave with a sense of surveyance, of watchfulness. Garneray and Jouy’s pretension to a comprehensive yet neutral account is its most potent political statement. Looking again at Hendaye, we notice a particularity in Garneray’s iconographic programme: for a picture of a port, we see in fact very little of the port itself. We are located, as Jouy emphasised, on French soil – not in the French sea. Despite a vignette in the volume’s preface showing Garneray sketching from the hull of a small boat, in the majority of images we stand, as viewers, on land. This territorial aspect is part of a compositional strategy that allowed Garneray to indicate simultaneously the Frenchness of each port while gesturing toward its necessary function as a site of exchange and openness. In contrast to the frontality of Vernet’s compositions, in which we are given a stage-like view, Garneray often positions the viewer perpendicularly. Facing the U-shaped harbour, the artist offers a composition divided between land and sea. In Honfleur, for example, we are placed atop a hill, astride a road leading down into the port. A detailed rendering of the town and the lush vegetation surrounding it fills the right half of the image. A sweeping coastline gives way to a calm sea dappled with distant ships on the left. 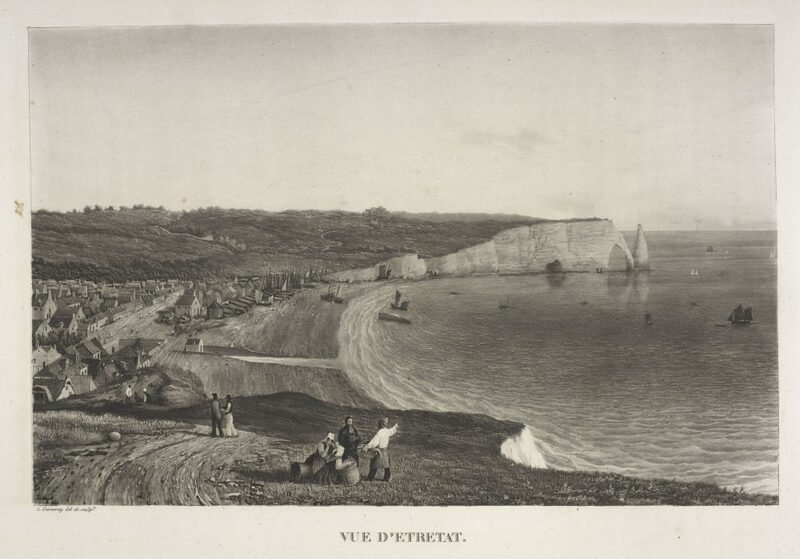 Again with Etretat and Fecamp, the image is divided between land and sea. Garneray cleverly constructed a balance between France and elsewhere, a technique that indicates a cautious positioning in keeping with the reduced role of the French navy in the 1820s. The importance of the topographic as a site for negotiating the politics of territory was not limited to paintings and prints. In the 19th century, topographic conventions of representation found their way into an unexpected arena – the decorative arts. In addition to porcelain services featuring the French departments and characteristic forests, in 1839, the director of the state-sponsored Sèvres porcelain manufactory commissioned Garneray to decorate a series of plates in a style in keeping with the Views. 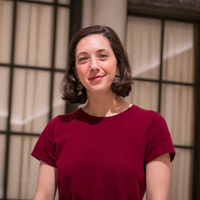 Garneray selected to pursue a service dedicated to regional fishing, and the resulting Service des Pêches presents characteristic fishery practices set against a backdrop of ports from France and abroad. Between 1839 and 1852, Garneray completed 96 plates and 12 compote pieces. 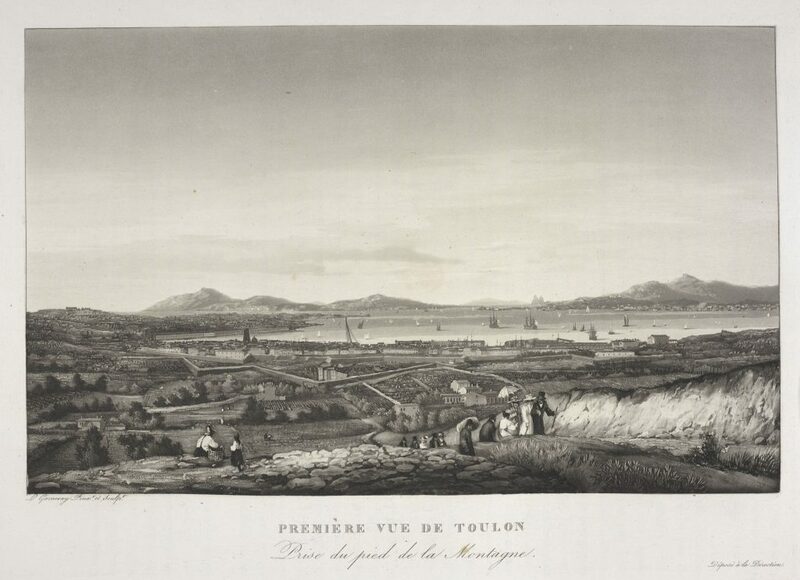 This one shows sea bass fishing in Toulon; we can see the way Garneray was borrowing the form of the mountain and the outline of the harbour from his engraving, and perhaps even copying the same warship. The Sèvres porcelain reminds us that in the 19th century, the topographic was not limited to a single format but rather participated in a larger repositioning of landscape as the French state sought new form following the Revolution. Topographical imagery was addressed further to a wide range of constituencies, from the local seamen who perhaps purchased a single print to the wealthy patrons of porcelain. Transforming the history of topography requires taking a wider view of both its presence and its political import, particularly when it was supported by the state, as was the case in France. The plates, the prints, Garneray’s small paintings, the installation of the Vernet ports in the Ministry of the Marine: these were all ways of using landscape to secure a specific vision of the nation, as diverse but united, well-defended but open to the world. 32, no. 9 (May 2010). London Review of BooksJohn Barrell, ‘Topography v. Landscape’. (7 November 1821), no page number.Galignani’s Messenger ‘France’. 23 (1825), p.363. Costumes Parisiens ‘Vues des côtes de France…’. 3 (1855), p.147. France Maritime ‘Peintres de Marine: Louis Garneray’. (Urrugne: Pimientos, 2004). Vue des côtes et des ports de France en 1823 . Originally published by the British Library under the terms of a Creative Commons Attribution 4.0 International license. This entry was posted in Uncategorized and tagged Art History, France, French, History. Bookmark the permalink.